Book of the Week. 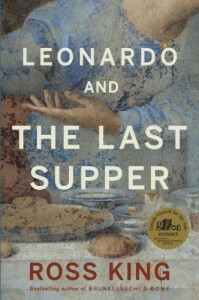 Listen here: http://www.bbc.co.uk/iplayer/episode/b01m5dw6/Book_of_the_Week_Leonardo_and_the_Last_Supper_Episode_1/blurb - Leonardo and the Last Supper tells the fascinating story of what went on behind the scenes when Leonardo da Vinci was commissioned to paint what became one of history's greatest masterpieces.Working as pictor et ingeniarius ducalis (duke's painter and engineer) for Lodovico Sforza, the de facto ruler of Milan, Leonardo was engrossed with a commission to create a monumental equestrian statue. But with unrest at home and abroad Lodovico had another use for the seventy five tons of bronze that his artist required.Read by Nigel Anthony and abridged and produced by Jane Marshall Productions.Producer: Jane Marshall.Fascinating subject, uninspired rendition.